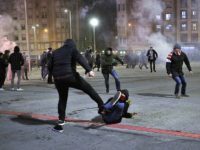 Athletic Bilbao and Spartak Moscow fans clashed on the streets of the Basque city ahead of their Europa League match on Thursday night. Clashes broke out between Olympiacos hooligans and riot police at the Georgios Karaiskakis Stadium on Sunday after Olympiacos lost 2-1 to AEK. A small group of Colo-Colo fans tried to pinch a banner from Antofagasta supporters at half-time of Saturday's Primera División match.